How to Deal with Multiple Printers Easily. There is a common situation in many offices, we call it Printer Hell, when the work freezes or even stops just because one or another unit can’t print its documents as the device is out of supplies. When there are few of them, the issue resolves in a minute. The Hell comes when a company owns dozens of various printing devices all over the building. And not only replenishing of ink or toner is the problem here; a system administrator also has to monitor every device for the remaining resources. O&K Print Watch takes the hardest part upon itself. Install the O&K Print Watch service on any print-server or PC with a connected printer or MFD, and enjoy fast and convenient monitoring of remaining supplies via the user friendly control program, daily detailed reports on every printer sent to specified e-mails and more efficient work of the supply department thanks to predictable consumption of expendables. Setting up Low Printer Supply Alerts. With O&K Print Watch you can easily track remaining supplies of a printing device. For every printer in the network the program displays the level of toner or ink in cartridges, or the PC drum resource left. The program also estimates the number of pages the device can print using the rest of supplies and total number pages printed since last replenishing. A great time-saving feature of O&K Printer Watch is automatic e-mail alerts notifying an administrator when a certain printer is getting low on ink. You can add as many e-mail addresses as you want with different threshold values of supply level each. 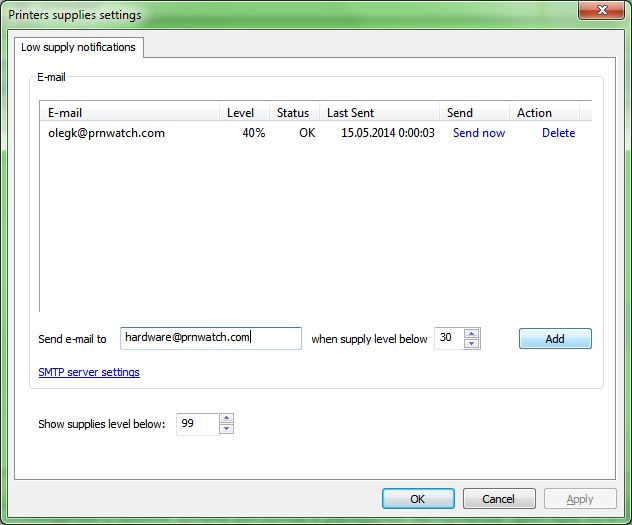 E-mail notifications are sent once a day using the specified SMTP server. Receive Printer Supply Reports by E-mail. 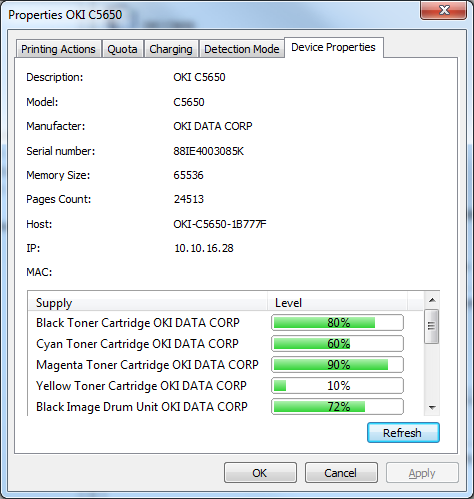 O&K Printer Watch composes detailed reports on all printers in the network and sends it to specified e-mails. Not only does this allow replenishing ink and toner resources in time or replacing depleted expendables of a printer; this promotes much more efficient operation of the supply department of the company in a whole. Indeed, a daily report quickly reveals devices that are getting low on supplies and shows the amount of pages left, so you can simply order the required amount of cartridge supplies preliminarily and thus can avoid unnecessary slowdowns of the workflow. A typical report shows the printer model and the serial number as well as the location and the IP address for easy identification. For each printer, the reports shows the exact amount of supply left based on information passed by the device driver, pages printed and pages remaining. The last value is calculated based on both driver information and O&K Printer Watch usage statistics of the device. 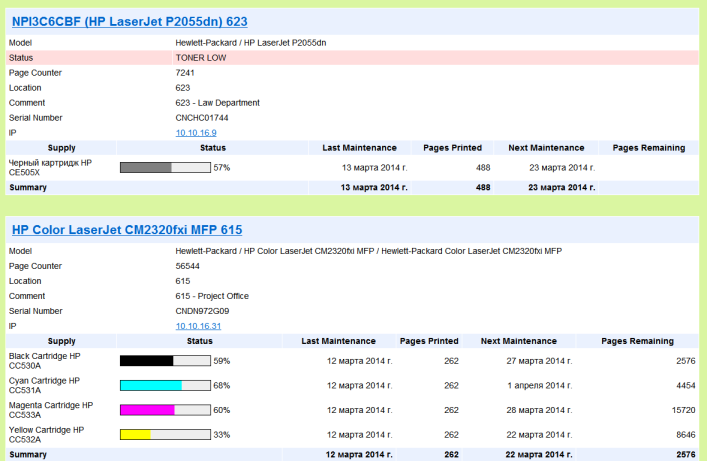 The Last Maintenance field shows the date the printer supply was last replenished, and the Next Maintenance field estimates the date next maintenance should be performed. Overall, O&K Printer Watch significantly simplifies gathering of information about remaining printer supplies in the office. After easy installation, the service works totally in the background providing information to the Control Program. While the operator either checks monitored devices manually or sets up e-mail alerts to be informed when certain devices need scheduled or urgent maintenance. Taking into account such functions as printing queue control, printing quotes for various users or computers, detailed report on usage of printing devices and many other capabilities, O&K Printer Watch is a versatile and irreplaceable tool for any office with a lot of document works.